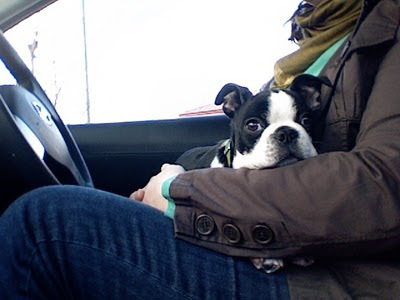 shopEvalicious.com: do you love boston terriers? do you love boston terriers? Thought this post was so cute over at Freckled Nest's blog. Eddie grew up with 2 of them and loves them to death. He sometimes questions why we didn't get one of these little guys instead of a Mylo. Bath time would be so unbelievably easy!! Eddie, I really don't know why sometimes (as much as I love our little Golden Nugget). Golden Nugget! That's cute. I call our's a Golden Deceiver. He's sick, has some kind of eye infection, it's the saddest thing ever. Awww, love this! Wish I would have seen the post asking for pics, we have two rescue (special/medical needs) Bostons and they are ALL I take pictures of LOL! I have a terrier too, and a Golden, and I will tell you, I love them both. However; my Golden is the BEST DOG IN THE WHOLE WORLD! Even though if he hasn't had a bath in a few weeks, he smells like a dog, and even though he was a naughty pup, as an adult dog, I would pick him over most of my friends, and quite possibly every other human being I know.